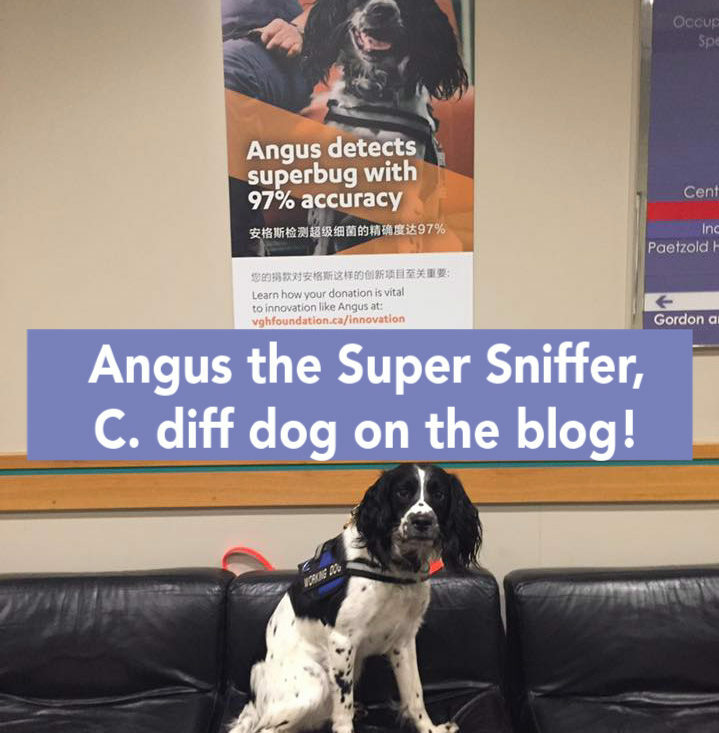 Angus uses his Super Sniffer to hunt for the superbug, C. diff. What is a day like in the life of Angus? Angus gets up at 4am to start getting ready for work. He enjoys a wrestle and a game of tag in the backyard with our other dogs before he has breakfast and leaves for work. His workday starts at 6am (good thing he is a morning dog, his handler not so much). We get to work and play fetch for a few minutes then do our daily maintenance training. I put out a few hides for him to find, which he typically does with ease. Angus reviews his social media accounts and posts new pictures of himself and our other detection dogs. After reviewing the list of new CDI cases, I put together the list of units we are going to screen for the day. Angus searches 4-6 units a day. We also spend time answering staff and patient questions about what we do and also do some “on the spot education” for staff/patients/families about C. diff. By 2pm, we are both exhausted, and it is time to go home. Does Angus live with you at your home? Is Angus at risk of picking up a C. diff infection while on the job? Yes, but the risk is very small. Angus is a healthy dog and is checked regularly by our vet. The key factor in mitigating the risk to Angus is his immune system. He is not immunocompromised; therefore his risk of infection is very low. If Angus gets sick, for any reason, he is pulled from work and stays home until he is well again. I am at a higher risk of contracting C. diff again then he is because I had a past C. diff Infection. Are other countries using C. diff dogs? The only other know documented country is the Netherlands. Hostche Luik and her beagle Cliff, who were the inspiration for our program, still do C. diff detection work. They look for C. diff in patients. We look for environmental reservoirs of C. diff contamination. In your experience with Angus, what are the most common reservoirs for C. diff bacteria in the hospital? There was a study out of Nepal, India published this summer about the bacterial contamination of frequently touched items in the hospital. Angus’ alerts have been the same items, plus equipment and carts standing in the hallways on the units. This highlights the importance of proper hand hygiene for staff, patients and families. We are hoping to publish some of our findings later this year.